They love falafel, apparently. It’s easily said, but do they actually mean it? Well, the owner changed the well-regarded Offbeat Café into a new eatery that pretty much just serves the Arabic street food-gone-mainstream. That clearly shows some commitment and knowledge. What we know about falafel, however, you can write on the back of a chickpea, so let’s bluff our way through this. It’s not quite all falafel, and we kick things off with a halloumi salad wrap (£3.75), which is fresh and healthy and loaded with lettuce, red cabbage and houmous. It’s pretty good but the falafel melt wrap (£3.75) is even better – adding in cheese, jalapenos and chilli sauce and giving even La Choza’s burrito a run for its money. The cheese and chillis together create a warm, rounded flavour. Then it’s on to a falafel box (£3.95), in which we swap the delicious chickpea patties for one of the day’s specials, curry falafels. They’re sweet and spicy, the heat dancing on the tongue afterwards, and there’s a mountain of salad in there – including red cabbage, yellow peppers, gherkin and grated carrot – all crisp and delicious and topped with moist houmous and sweet chutney. 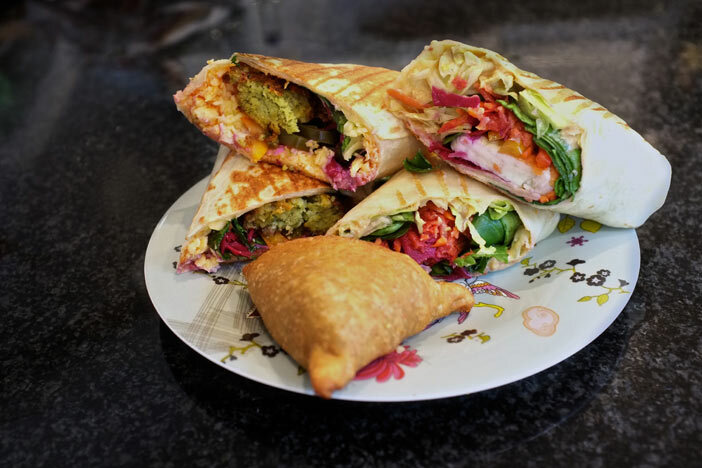 We don’t need it, but we try a butternut squash and broccoli samosa (£1) too. It’s mild and avoids being too greasy or crispy, which makes a change. Actually this food review is the third time in well under a week we’ve been to We ♥ Falafel, which should give you some idea of how much we ♥ the place. Great value, tasty food and fairly healthy. We can’t think of anything to complain about. We took the food away with us before photographing and making notes, so almost certainly not.